All the original settlers, including black “pobladores” (“townspeople”) Luis Quintero and Antonio Mesa, married racially mixed women and built their makeshift houses of willow branches, tule reeds and mud. Pobladores de Los Angeles. The term “Californio” is commonly used to identify a Spanish-speaking, mostly Roman Catholic people, or of Latin American descent, born in Alta California from the first Spanish colonies established by the Portolá expedition in 1769, up until the Treaty of Guadalupe Hidalgo in 1848 — in which Mexico ceded Alta California to the United States. The area had been long occupied by the Hokan-speaking people who fished, hunted sea mammals, and gathered wild seeds. They were later replaced by migrants, possibly fleeing drought in the Great Basin, who spoke a Uto-Aztecan language and were called Tongva (Wikipedia). By the time of the arrival of the Spanish in the 18th century, there were 250,000 to 300,000 native people in California and 5,000 in the Los Angeles basin. The land occupied and used by the Tongva covered about four thousand square miles. Their trade extended to the Colorado River and beyond. In the Winter of 1845–46, the federally commissioned explorer John C. Frémont and a group of armed men appeared in California. After telling the Mexican governor he was merely buying supplies on the way to Oregon, he instead entered the populated area of California and visited Santa Cruz and the Salinas Valley, explaining he had been looking for a seaside home for his mother. Thus, the Mexican-American War was extended to California. The Siege of Los Angeles was a military response by armed Californios to the occupation, which John C. Frémont began. The Americans held northern California but General Jose Maria Castro and Governor Pio Pico planned resistance in the south around the Los Angeles area. On Oct. 8, 1846, American troops marched from San Pedro harbor up Alameda Street to the Dominguez Ranch, where they spent the night. But the Californios had a surprise for them. Although there were only a few dozen locals against hundreds of soldiers, the Californios were able to trick the soldiers into thinking that they had more arms than they did by rolling their only cannon around the field between shots. The battle was won, but over time, the war was lost. Kumeyaay historian Gary Ballard writes: The California Gold Rush 1848-1855, in particular, was catastrophic to the indigenous population and their tribal lands. It was estimated that some 300,000 foreigners poured into California during this seven-year period. By 1900 it was estimated that less than 16,000 California Indians had survived the invasion of their homelands (some 134,000 California Indians were lost during this 52-year period while the United States Government was in control of California). Of the principals in my film, “Who Are My People?” all four, Alfredo Figueroa, Reverend Ron Van Fleet, Phil Smith, and Preston Arrow-weed, trace their lineage to Early California and before. Chairman Anthony Pico of the Viejas Band of Kumeyaay Indians, also in the film, is a relative of Governor of Mexican California, Pio Pico. Figueroa is a relative of General José Figueroa, Mexican territorial Governor of Alta California from 1833 to 1835. Figueroa oversaw the initial secularization of the missions of upper California, which included the expulsion of the Spanish Franciscan mission officials, liberating Indians, who were by then under Mission System control. Ballard reports, “It is believed the Kumeyaay — one of the largest and strongest pre-contact tribal groups in California — had only 1,000 surviving tribal members at the turn of the 20th century (1900). 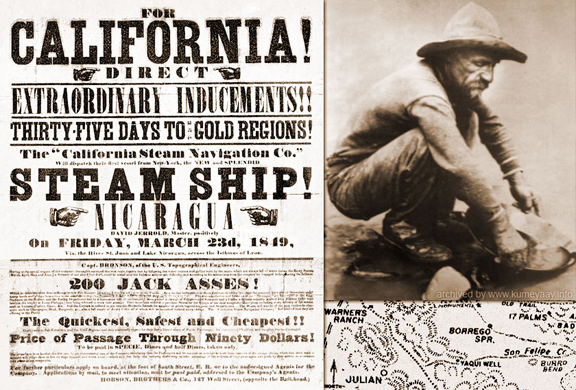 Some $5 million of gold was taken out of the Julian Eagle and High Peak Mines alone, during the 1870s, from deep in the heart of pre-contact Kumeyaay tribal mountains of San Diego County.